Lisa M. Nommensen is an Associate of Law Office of Nooney & Roberts practicing in Jacksonville, Florida. Her practice focuses primarily on personal injury and estates. Ms. Nommensen graduated from Florida Coastal School of Law with her Juris Doctor in May of 2016. While in law school, she served as secretary of the Military Law Society, was a member of Phi Delta Phi Legal Honors Society, awarded Pro Bono Honors for logging more than 250 hours during her time at Coastal, and she was a member of the Moot Court Honor Board. In Spring 2015, Lisa interned for Judge Joel B. Toomey of the United States District Court, Middle District of Florida. In Fall 2015, Lisa interned for the United States Attorney, Jacksonville Division under the mentorship of Rodney Brown, AUSA. While in law school, Lisa clerked for Nooney & Roberts and learned the ins and outs of the firm. 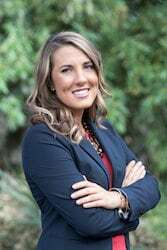 Her time as a law clerk triggered her enthusiasm for personal injury work and after graduating law school began her career as a personal injury attorney representing parties in products liability, dog bites, motor vehicle accidents, and premises liability cases. Although she is new to the firm, she has already handled cases with six figure outcomes. In her free time, Lisa enjoys spending time with her family, coaching little league soccer, scuba diving in Bonaire, attending local music performances, and anything Florida Gators.